Seat Sandal at 736 metres (2415 feet) is very noticeable from the village of Grasmere but is overshadowed by its much higher and more dominant neighbours in the Eastern Fells, Helvellyn and its parent fell, Fairfield. Whilst Seat Sandal’s eastern slopes are steep and craggy as they fall away towards Grisedale Hause containing Grisedale Tarn, its western slopes above Dunmail Raise are smooth and grassy. The summit views are wonderful. Towards the west the Solway Firth and Criffel can be seen and to the south on a clear day Morecombe Bay can be viewed. To the north and east the distant view is limited by the Helvellyn and Fairfield ranges. Grisedale Tarn below Seat Sandal lies at about 500 metres (1770 feet) between the higher fells Fairfield and Dollywagon Pike. The tarn which is about 33 metres (110 feet) deep is the Lake Districts highest substantial tarn. It flows out to Ullswater to the north east and is home to brown trout, perch and eels. 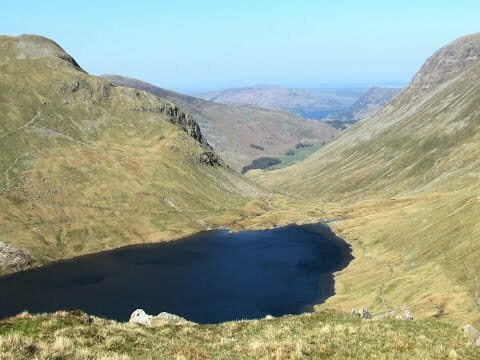 Legend says that Grisedale Tarn is the resting place of the crown of the Kingdom of Cumbria, after the crown was taken there in 945 by soldiers of the last king, Dunmail, after he was slain in battle with the combined forces of the English and Scottish kings. From the lay-by we walk along the road towards the Travellers Rest pub. At the bus stop we turn right crossing over a cattle grid onto a track that leads to a farm called Winterseeds. We walk round the back of the farm and bear right across the field to go through the wall and turn left. We head forwards over the field to go through the gate in the wall corner then turn right leaving the track going uphill to the wall at the far side of the trees. We go through the gate and turn left following the yellow arrow. We head forwards following the track with the wall on our left. The track bears right and we go through a gate and keep heading forwards uphill along the valley, crossing over the stream twice. As we get near the top we cross over the stream again just in front of a waterfall. We keep heading uphill over the brow then the path levels out before rising again. We go over the top and Grisedale Tarn is in front of us. We turn left at the broken wall and start to ascend very steeply uphill. There is some scrambling to do as we make our way up to the summit of Seat Sandal following the broken wall. At the summit cairn we head straight forward to the next cairn and bear slightly left to a third cairn. We start heading downhill bearing slightly left on the faint path. We now follow the ridge steeply downhill we can see Grasmere in front of us in the distance. As we get near the bottom we go through a wooden gate to the left of the ridge. We head forwards then follow the path round to the right until we reach a stone barn. We go through the gate on the left at the side of the barn then turn right and follow the track until we reach the main road. We now turn left and follow the road back to the car park. This is a moderate walk on grass and gravel tracks and paths also some tarmac road. The ascent to Grisedale Tarn, on well walked paths and tracks, is steep in places. The ascent to the summit of Seat Sandal from Grisedale Tarn is very steep and requires a little scrambling and the descent path is faint. This walk is done anti-clockwise. Elevation: approx lowest point 78.3m (256.90ft) approx highest point 734.80m (2410.76ft) approx ascent 677.5m (2222.77ft). Approx 4.8 miles allow 3 to 3½ hours using OS Explorer Map OL7 and OL5, The English Lakes, South-eastern area and north-eastern area. Start point: lay-by car park on the A591 on the right just beyond the Travellers Rest pub travelling from Keswick. Grasmere is located just off the A591 south of Keswick and north of Windermere and Ambleside in the Lake District, Cumbria. From the A66 at Threlkeld take the B5322 on the left, which by-passes Keswick. At the t-junction at Legburthwaite turn left onto the A591 which runs by the side of Thirlmere Lake to Grasmere. The free lay-by car park is on the right just past the Travellers Rest pub on the A591 before Grasmere. Parking: There are three Pay and Display car parks, £8 for all day, in Grasmere and very limited free road side parking. There are three free lay-by car parks on the main A591. There is no public toilets on-route the nearest ones are in the pay and display car park on the right just before entering Grasmere village and also in the village near the police station. For refreshments in Grasmere there are three pubs the Red Lion, the Wordsworth Hotel and Spar and the Grasmere Hotel plus there are many cafes and other places to eat and drink. There are also plenty of shops to browse round. There are three more pubs nearby on the A591 the Travellers Rest, the Swan Inn and the Daffodil Hotel and Spar. The nearest town is Ambleside.